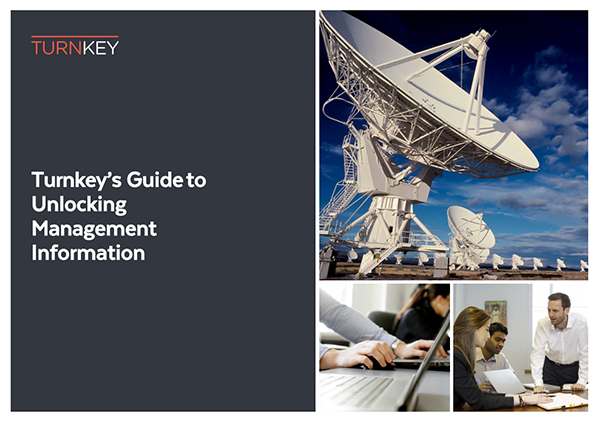 Here you'll find all of Turnkey's webinars, guides, presentations and other insights available in one place - for free. 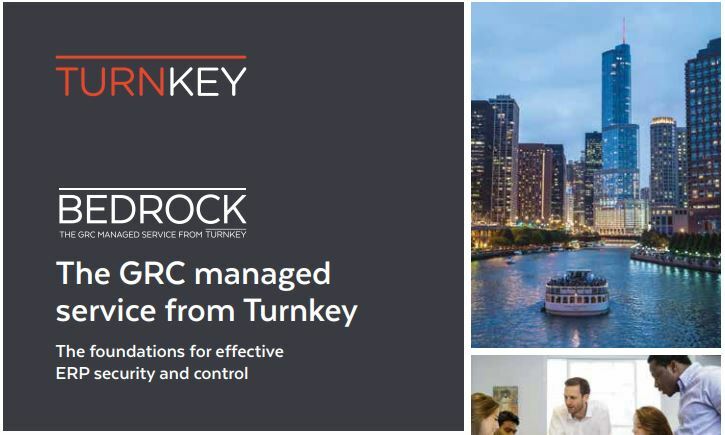 It's your go-to resource for GRC and risk management. Many large and established organisations have struggled to transform their business models and operations to fully embrace the digital era. As a result, we’ve witnessed smaller, more agile disruptors leverage digital platforms to turn traditional markets upside down through the rapid delivery of digital products and services. 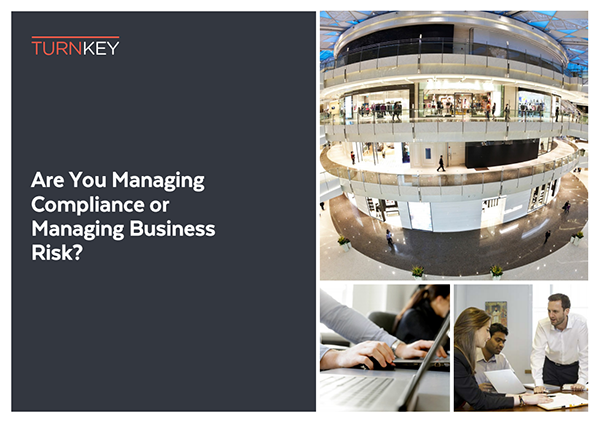 to the Turnkey Insights Blog. Talk to a Turnkey Expert. Send us your email & we'll be in touch. 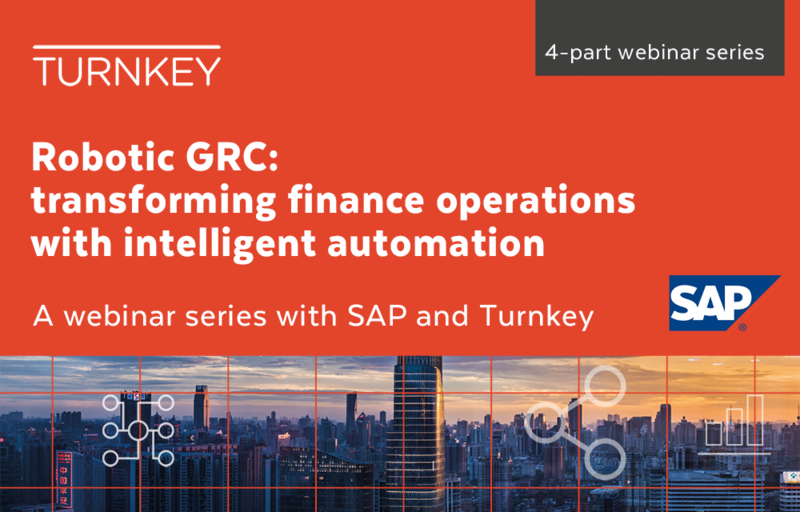 Following last year's successful event, ‘Robotic GRC for the finance function’, SAP and Turnkey are running a four-part webinar series looking at how SAP customers can drive intelligent automation across finance with SAP GRC. 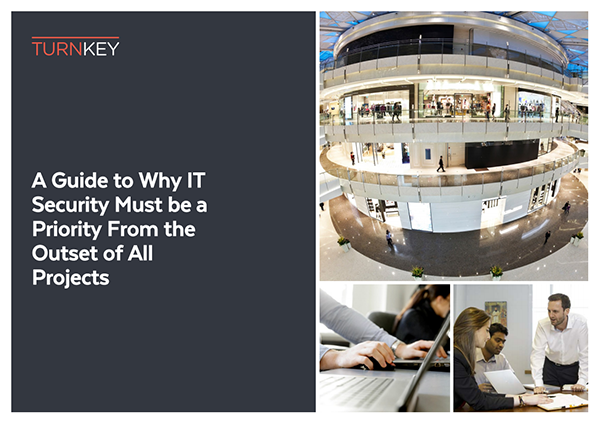 While disparate identity management tools and internal conflicts of ownership serve to exacerbate the challenge, often the biggest issue is a lack of governance. 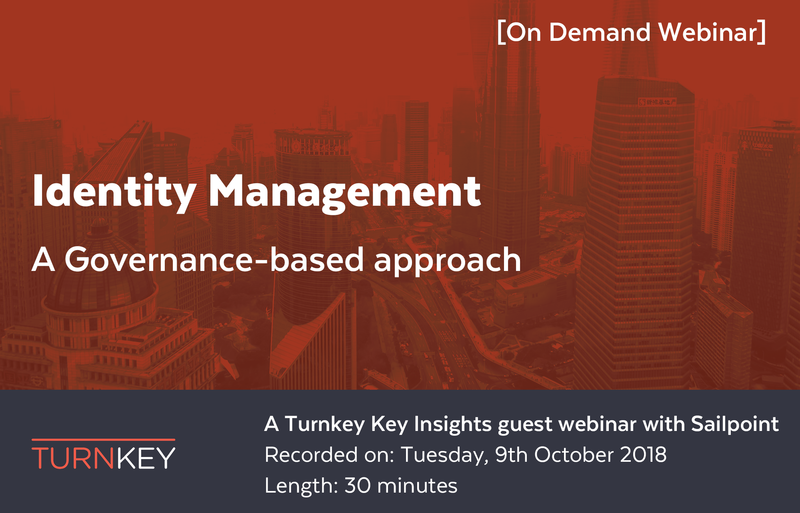 Effective identity and access management combines access provisioning and centralised visibility, with a robust governance model and consistent policy enforcement. 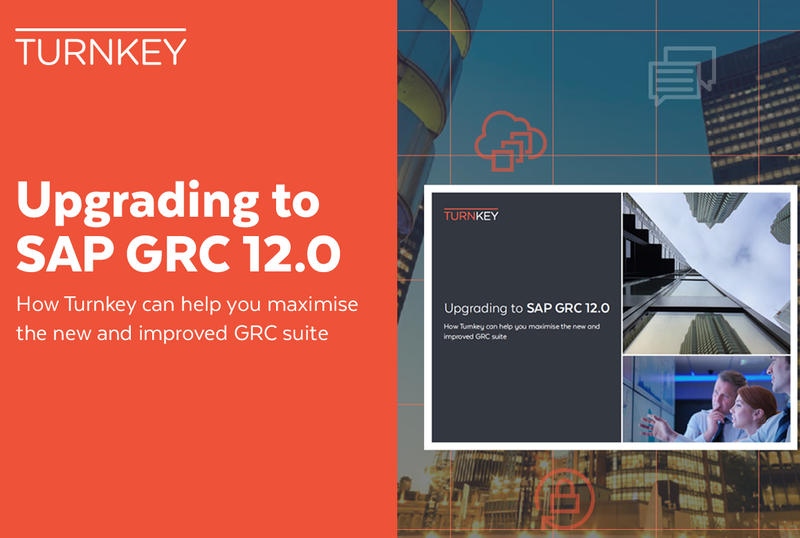 This guide will cover how Turnkey can help you maximise the new and improved SAP GRC suite and answer questions such as - Why should you upgrade to SAP GRC 12.0? How do you ensure that all the benefits are realised? How does the upgrade process work? For SAP customers, the roles of SAP Identity Management and SAP GRC are not always clear - especially the opportunity to integrate these solutions and automate many aspects of the IAM process. 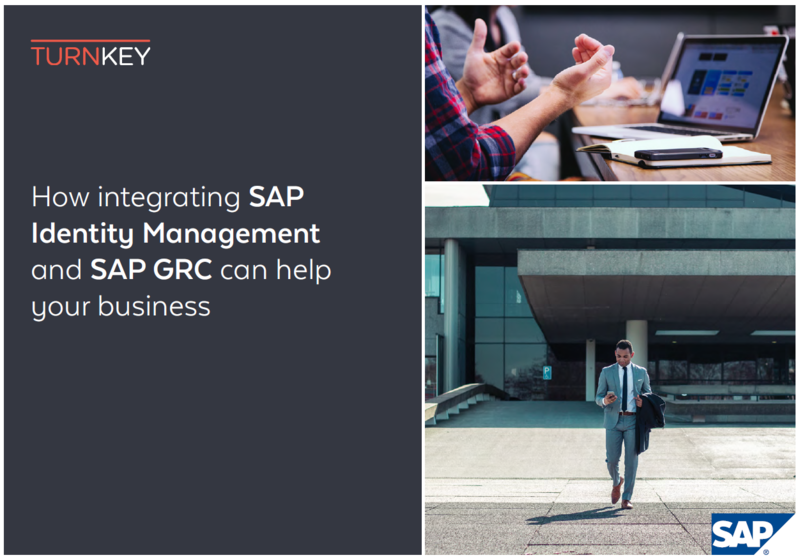 This guide, 'How integrating SAP Identity Management and SAP GRC', can help your business explore this issue in greater depth. 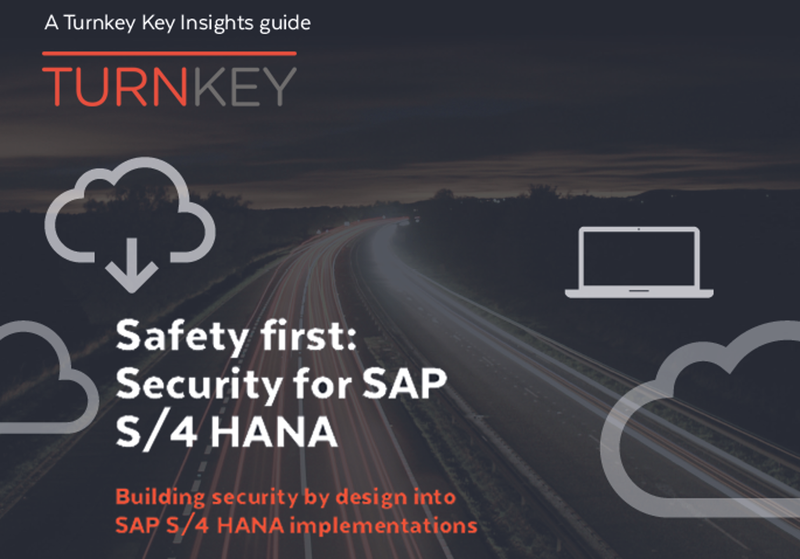 Security with S/4 HANA is very different and you can be vulnerable to new risks. It’s likely that your SAP environment will become more complex, which means more security and access activities to manage and control. 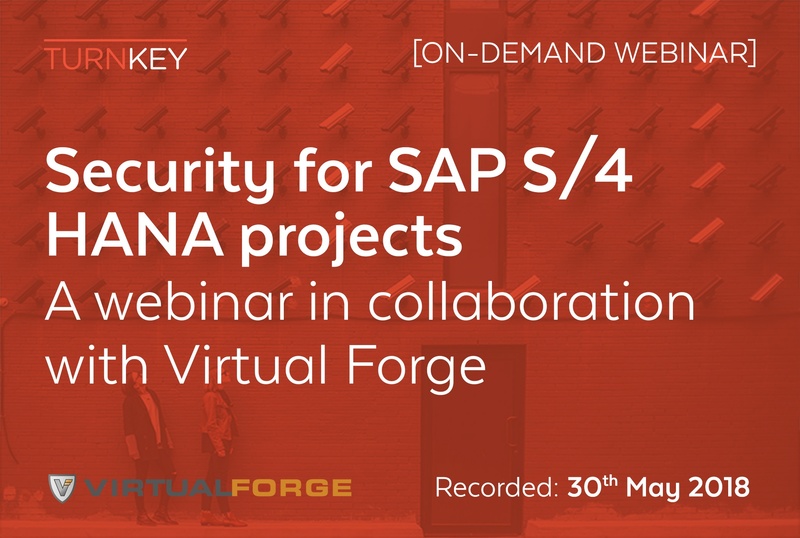 Our latest webinar explores these key issues with our guest Patrick Boch from SAP security experts, Virtual Forge. 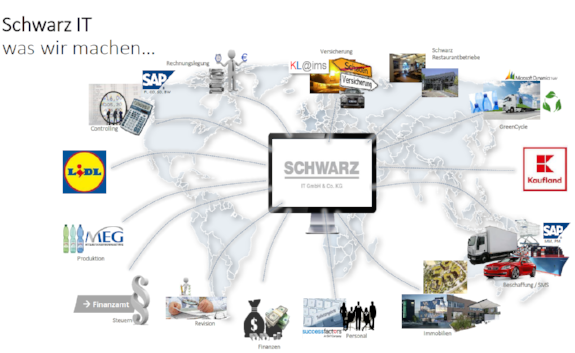 The SAP Forum for Finance Management and GRC was characterized by many very profound lectures, especially about S4/HANA applications. Thack Brown, General Manager and Global Head of LoB Finance, SAP, made an interesting statement in his keynote speech...more can be found in this presentation. This eBook provides a high-level summary of Privacy by Design. 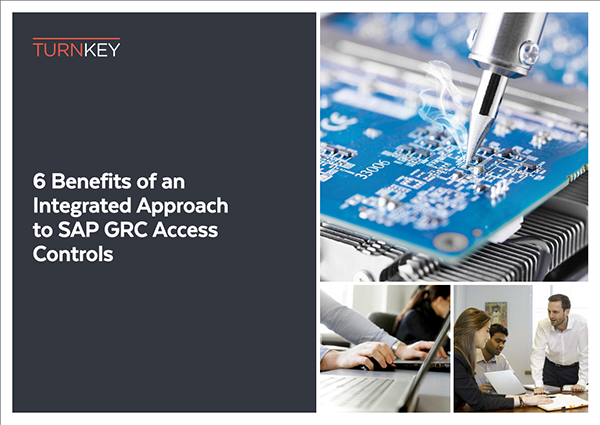 Using SAP GRC as an example we have also included some thoughts around how GRC tools might be leveraged to support compliance efforts in the areas of - Accountability, Data Protection Impact Assessments (DPIA) and appropriate technical and organisational measures. 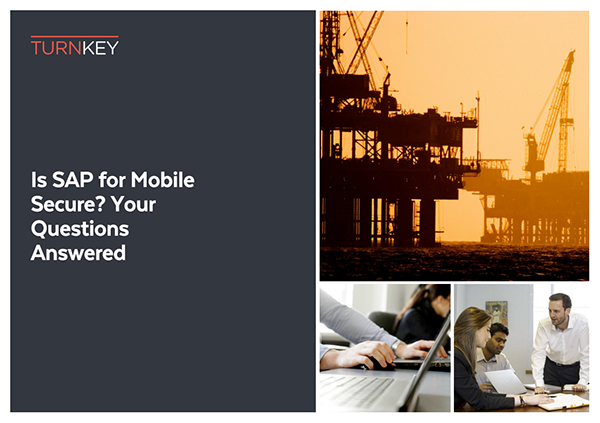 In this webinar, we discuss the new SAP Access & Process Control, and SAP Risk Management functionality, SAP GRC’s move towards mobile and Fiori Launchpad and the key implementation considerations. 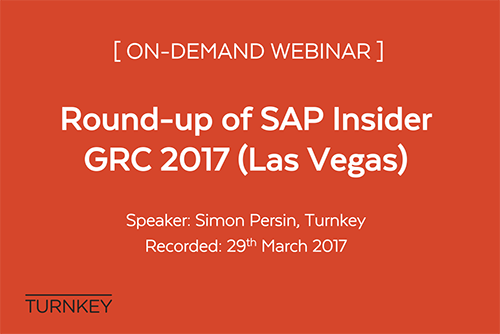 This webinar will cover the following: the main takeaways from the keynote sessions, the latest customer success highlights, the key trends that emerge from the event, such as data privacy and cyber security, other news about SAP’s technology developments. 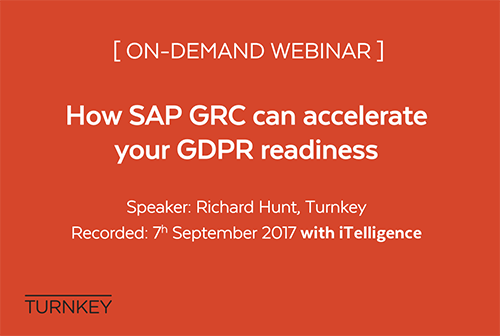 In this webinar, Richard Hunt, Managing Director of Turnkey, will examine some key ways you can use SAP to meet your GDPR obligations Among other issues, he’ll explore how to use SAP’s Process and Access Controls to control & monitor access to personal data & conduct Privacy Impact Assessments, use self-assessment for GDPR activities such as evaluating product compliance and more. 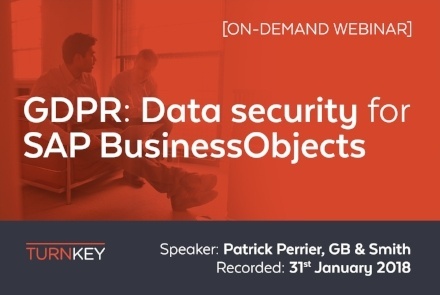 Focusing specifically on SAP BusinessObjects, the webinar will cover how to ensure careful control of access to personal data, setting up detection and alerts for any data breach, identifying specific data for flagging and removal, archiving, backup, restore and disaster recovery strategies and more. 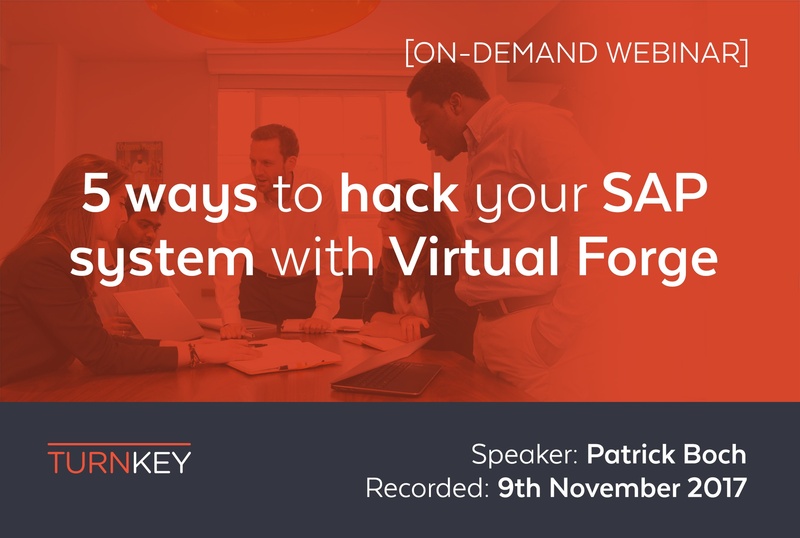 Watch Patrick Boch from leading SAP Security solutions company, Virtual Forge explore common vulnerabilities which compromise an SAP system directly, the typical indirect attacks which open the doors to your SAP system landscape and easy strategies to keep attackers out. GDPR will dramatically change the way organisations handle personal data - with huge penalties in store for businesses failing to comply. Businesses running SAP ERP systems hold a wide range of personal information and must, therefore, take steps to ensure their SAP environment remains fully secure. Read the guide for more details. This thought-provoking session explores some fundamental questions. How do we consider risk in our personal and business decisions? How do we use technology and can we do more with it? Do we have controls that we don't even think about? Ultimately, it all comes down to how we can run our business better. Watch the webinar to find out more. 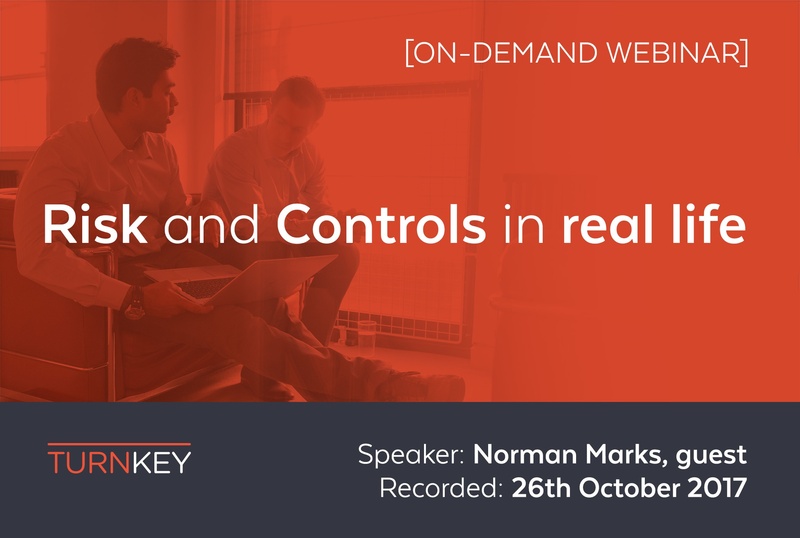 In this webinar, Richard Hunt talks about how to leverage SAP Access Control to ensure personal data access is restricted only to those that need it, integrating Privacy by Design obligations & Data Privacy Impact Assessments (DPIAs) into your ways of working and implementing new controls, such as DPIA and breach identification/notification. Watch to learn more. 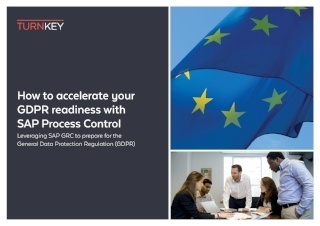 In this practical guide, we lay out a step-by-step implementation approach for SAP GRC practitioners, who’ve been tasked with ensuring their organisation is ready for GDPR. 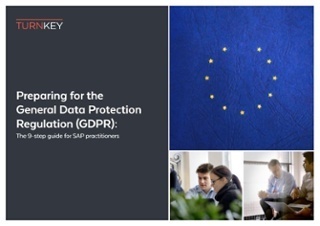 The 9 steps have all been identified as key elements relating to GDPR in an SAP environment, which fall either wholly or partly within the remit of the IT department. They are all based on Turnkey’s extensive project experience in the field, as well as what we regard to be good practice. With increased focus on the cloud and user experience, we'll also explore what this means to existing on-premise customers. 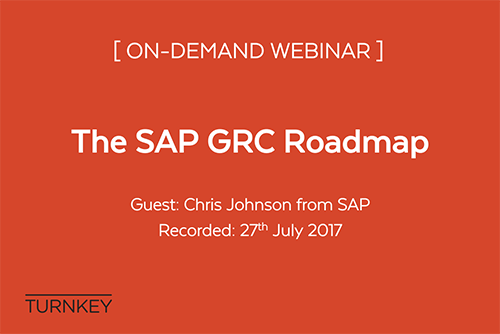 In this webinar you will learn more about how to move forward with SAP GRC in a hybrid environment, SAP's continuing investments in on-premise SAP GRC, plans to improve the SAP GRC user experience and more. 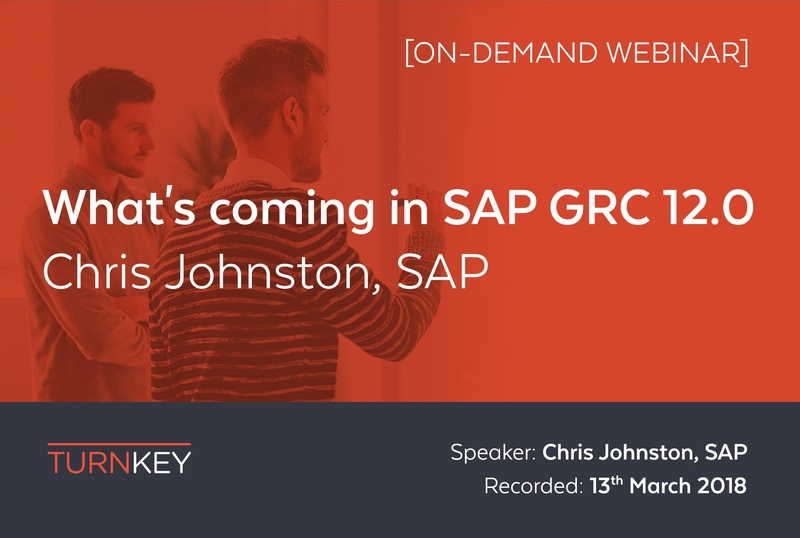 In this webinar, by Turnkey Consulting’s Simon Persin you will learn about the main external threats targeted at SAP & ERP systems, security in a complex SAP HANA environment, getting more from your GRC systems and where to best focus your limited resources. 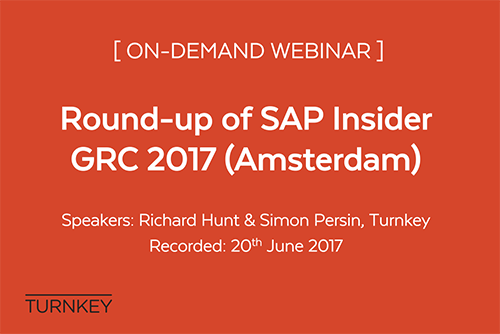 In this webinar, delivered by Turnkey Consulting’s Richard Hunt and Simon Persin you will get the latest updates from the conference including key insights from the speaker sessions, new SAP announcements of GRC products, customer success highlights and the general feeling of the conference. 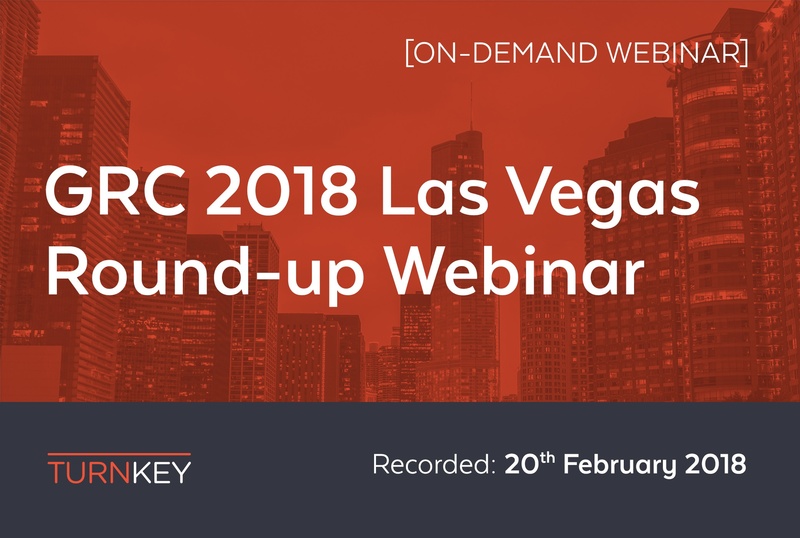 In this webinar, by Turnkey Consulting’s Simon Persin you will learn about the trends from the speaker sessions, new announcements of products, customer highlights and the general feeling of the conference. 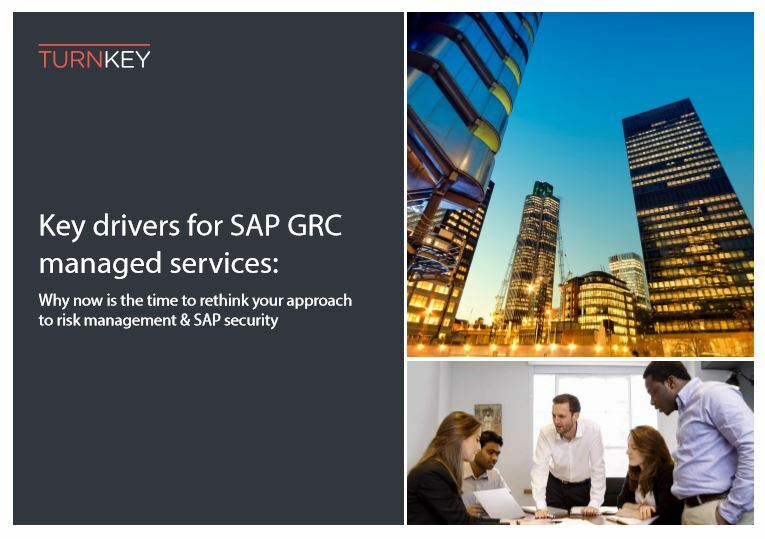 In this thought-provoking guide you will learn about, access SAP GRC from a secure, cloud-based environment, take a continuous approach using a more predictable cost model, relieve the burden of technical support and maintenance and ensure your business is supported by proactive SAP GRC & risk experts. 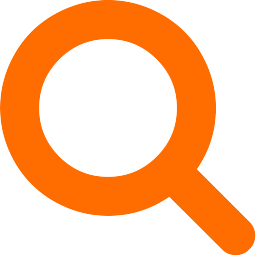 Read our guide to learn more. This complete guide will ensure your SAP systems are secure on mobile devices, by recognising increased risk from accessing corporate information with mobile devices, configuring comprehensive network security, user authorisations and user authentications, implementing end user policies to create a culture of shared responsibility and remembering the importance of security as technology becomes more integrated into everyday life. 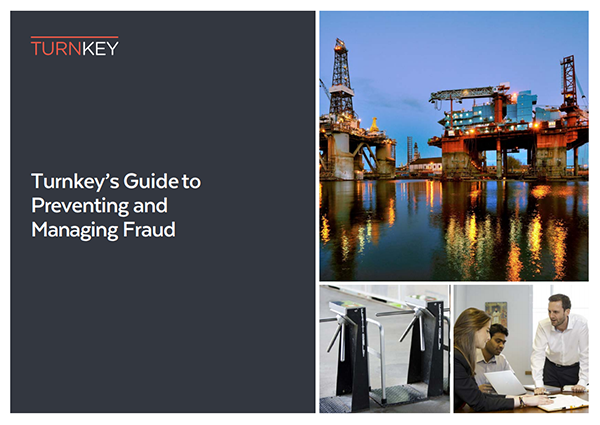 In this thought-provoking guide, you will learn about appreciating some of the major monitoring challenges that businesses face, ensuring complete accuracy and integrity in financial reporting, breaking free of the burdens traditionally associated with control compliance and harnessing the opportunity to achieve a new level of internal control and increased Return on Investment. 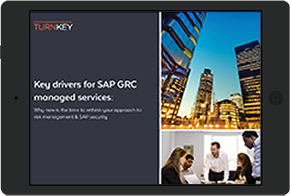 With the official launch of SAP GRC 12.0 (on-premise) in March 2018, Turnkey has been able to secure insights into the features and functions of this new release through our close relationships with the GRC Product and Solution Management teams within SAP, as well as being involved in the pre-release validation and testing. Whilst the understanding of the capabilities of the new product is important, many customers are seeking to understand the impact of any changes and what the likely update, migration and implementation path might look like. 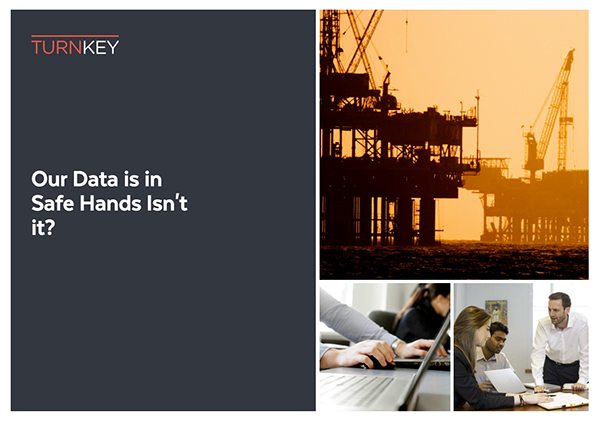 Our Data Is In Safe Hands, Isn't It?